The Ayr to Greenan Castle walk is about 4 - 5 miles there and back. 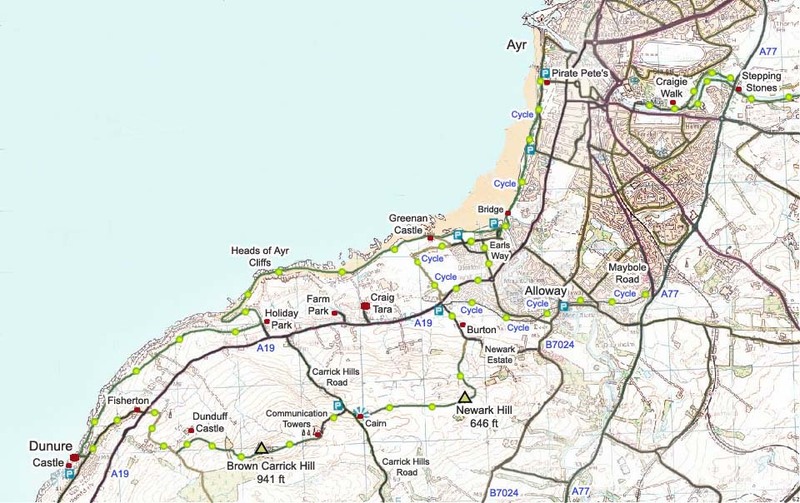 The walk can be extended to the Heads of Ayr adding another 4 miles, and Dunure adding another 4 miles. The first two images were taken in August when the flowers around Ayr are at their best. Below is Pavilion Road leading from Ayr town centre to the beach with the Pavilion building that is now an indoor/outdoor children's adventure playground, named Pirate Pete's. There are 100s of car parking spaces along the beach free of charge. Just before Pirate Pete's you will see the large plaque giving the history of the Low Green. From here, you can walk across the Low Green towards Greenan Castle in the distance, or go down to the beach and follow the beach to the Castle. Just under 2 miles south, you will reach the Doonfoot Millennium Bridge that crosses the River Doon. This bridge was completed in 2001. View looking back to Ayr. Cross the footbridge and follow the road towards the castle. About 400 yards before the castle, you pass through Greenan car park that is in the area of Doonfoot on the map. This car park can be used for a walk from here to the Heads of Ayr about 4 - 5 miles there and back. The map below shows the route along the coast. This map also shows the hill route that can be taken on the road back from Dunure. From the Greenan car park, you can walk to or past the castle along the beach. Only a really high tide will prevent you passing the castle along the beach. If there is a really high tide, you have to walk through the dunes, then follow the path over the hill behind the castle. The best way up to the castle, is go past on the beach, then follow the path up from the south side. A view from the window of the castle shows the 300 feet high Heads of Ayr cliffs about 2 miles further south. There is only one more rock outcrop that you may have to cross by footpath if there is a high tide. It is then a beach walk to the Heads of Ayr passing the Craig Tara Holiday Park on the way. The first part of the cliffs you reach are a bit rocky at the beach. The rocks only last about 100 yards then it is back to sand. Only a really high tide will prevent you from going round the beach. There is one spot in the middle you can climb up, otherwise it is a good few hundred yards to the other side. If there is a really high tide, you can go over the field on the left and through a gate then up round to the top. That route is a bit muddy so best go round the beach if possible. A view from the top shows the beach leading round with Greenen Castle in the distance and Ayr beyond that. There is a sheep fence all the road along the top, so if you want to take in the views from the top, it is safe if you stay on the right side of the fence. Large Image. The view from the top looking down is a bit daunting. There is one spot you can cross the fence but it is not advisable as it is a long way, straight down, from here, certain death should one slip. Large Image. At the south side of the cliffs there is a nice sandy beach. Beyond the beach is the walking route to Dunure, just over 2 miles further south. From the south side of the beach, there is a narrow path that leads up to the Heads of Ayr Holiday Park, where you can find the walking trail to Dunure. Large Image. The view below shows the path leading to the holiday park with the Carrick Hills behind. This is a good route to take if you are walking from Ayr to the Carrick Hills as, the main road out only has a footpath some of the way. This way, just go up through the park and cross the road to the road that leads to the top of the hills. I prefer to drive up to a place you can park, about two-thirds up, then walk the rest. There are great views of Ayr, the Ayrshire coast and islands from the top. The walking route to Dunure runs along the front of the Holiday Park. The Bracken Bar in the park serves drinks and meals all day in summer, only open weekend afternoons in winter though. A walk along the front of the holiday park, following the signs, takes you to the old coastal railway line. The path leads round the head in the distance, then through a couple of fields, then down to the coast just before Dunure. A look back at the Heads of Ayr, probably the best view of them. Large Image. After what seemed a long 2 miles, Dunure is visible. The last stretch of the walk goes down between the rocks, then along a shingle beach to the harbour. The shingle was the toughest part of the walk. Note the castle just beyond the harbour. A few kiakers getting ready to put out to sea. The Dunure Inn and Tea Room are in the background overlooking the harbour. Below is a view from the harbour showing the route back to Ayr, through the gap in the rocks in the distance. While at Dunure, you have to visit the historic castle and read the plaques about its history. The Commendator of Crossraguel Abbey, just over the hills, was roasted over a fire here in an attempt to get him to sign Abbey land over to the owners of this castle, the Kennedy's, setting off a murderous feud over the following years. The feud was between the Kennedy's of Dunure, Cassillis & Culzean, and their cousin Kennedy of Bargany who was supported by the Mure's of Auchendrane. Kennedy of Bargany was the brother in law of the Commendator. Kennedy of Bargany was killed in a skirmish by Kennedy of Cassillis and his men in the area between Ayr and Maybole. Kennedy of Culzean was ambushed and killed while traveling to Edinburgh by the Mure's in a revenge attack. Mure of Auchendrane and his son were found guilty of the murder of Kennedy of Culzean and beheaded at the Cross of Edinburgh in July 1611. More Information. The Bus 361 runs about 1 an hour between Ayr/Boswell Park by Ayr Bus Station and Dunure's Kennedy Park by the castle. Many people catch a bus or lift back to Ayr, or get a bus or lift out to here and walk to Ayr from here. It is about 7 miles between Ayr and Dunure, long enough for many walkers in one day. Route Map. If you are looking for a testing walk back to Ayr, you can take the hill route back to Ayr where you get great views from the top of the 941 feet Brown Carrick Hill. Brown Carrick Hill route. There is also a walking trail south from here that leads through Croy Beach, Culzean Estate, the village of Maidens, then along Turnberry Beach past the world famous golf course. That trail can be extended to the town of Girvan from where there is a scenic hill walking route with sea views south towards Ballantrae. Route Map. Maidens to Dunure Photo Tour.